Something that has been an issue for as long as I can remember has been my weight. From a young age I felt as if I was bigger than all my friends, and this made me uncomfortable and upset. I was self conscious, had low self esteem and hated my body. From around the age 14 I was constantly on and off diets, although never managing to loose a considerable amount, and never sticking to healthy eating and exercise. I’d always revert back to old habits of stuffing my face with chocolate and sweets and praying that by some miracle I’d wake up skinny. I eventually gave up trying around the age of 18, I still disliked my body, and I wasn’t truly comfortable but I stopped caring so much and started to come to terms with how I looked, and I learnt to ignore how I felt about my body. When I was 19 I spent three months travelling along the East Coast of Australia. I did what I wanted, and consequently ate what I wanted. I had an amazing time and didn’t care what anyone thought of me, at the time I didn’t even realise I was so overweight, I was just me. When I got back from travelling and stepped on the scales I nearly cried at what I saw. 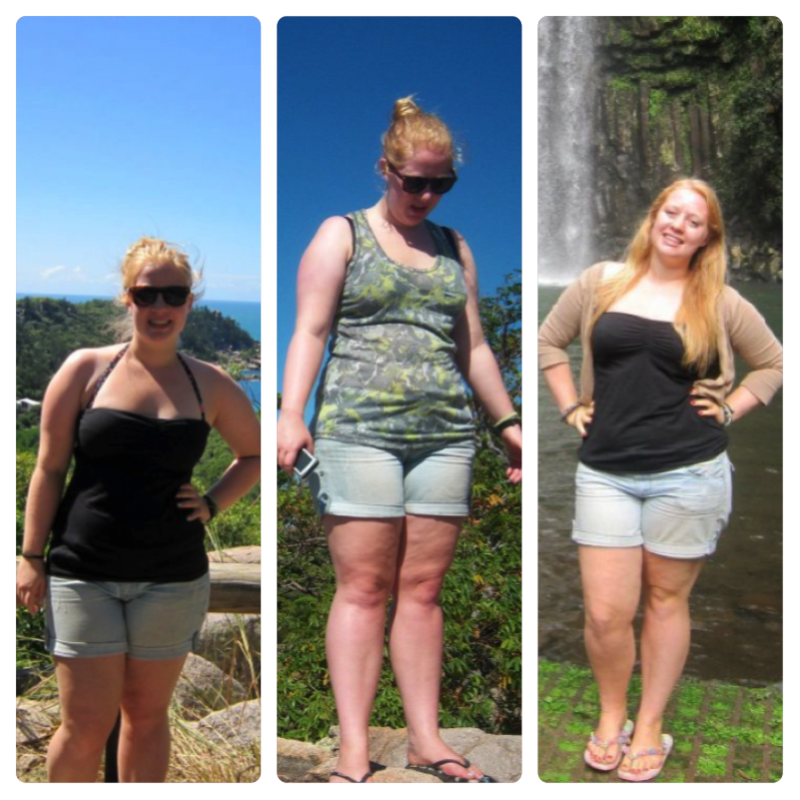 I was at my highest ever weight, and at that moment I realised I needed to loose weight and be more healthy. 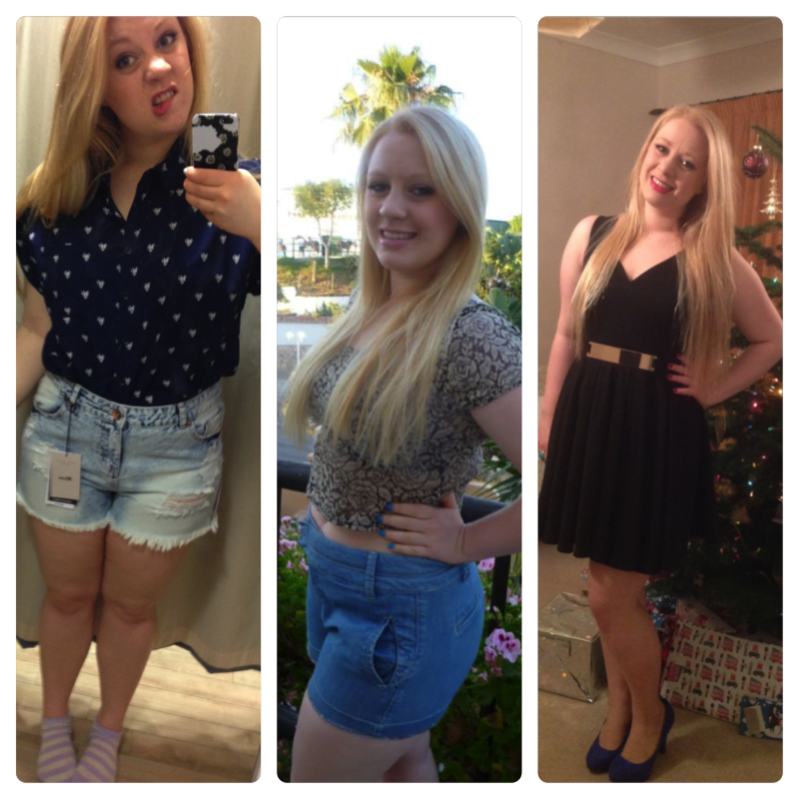 With starting Uni soon I knew I wanted to be smaller and that I wasn’t truly happy with how I looked. That summer I started to loose weight. Between June 2012 and now I’ve managed to loose about a stone and a half. Which I think shows in the photos of me. However that journey hasn’t been easy, and is by no means over, and I still want to loose another stone and a half. These past nearly two years my weight has been up and down. I pretty much plateaued for 6 months, then managed to break that and loose some more. However since December of last year I've managed to put back on half a stone. Christmas combined with starting a new relationship, as well as stress and boredom has allowed the pounds to creep back on. I’ve also struggled with a lack of motivation, and disappointed when my efforts seemed to fail. I have Poly Cystic Ovary Syndrome which, amongst over things, makes it more difficult for me to loose weight. I don’t know the exact science but people with PCOS find it harder to loose weight than people without because of how their body is working. This means when I do try really hard, and still see no results I get really disheartened and go searching for the chocolate and ice cream. However, I’ve decided, this is all going to change. Im taking responsibility for my weight and health, and Im changing things. I’ve decided to change my goal, and not focus primarily on weight loss, instead focusing on being healthier and fitter, and hopefully this will lead to weight loss, however slowly my body decides to act. So from now on I’m going to be posting a Weight Loss/Healthy Lifestyle post every Wednesday, to help me stay motivated. The posts will range from updates, tips and advice, things I’ve eaten, reviews and anything related to weight loss and healthy living. This time Im determined to stick to my goals and feel better about myself! Wow 4 and half stone is amazing! Wish I had the motivation to do that. Gaining weight after having lost is so disheartening and Im finding it really difficult to start back up again. It is all in the mind tho, I just need to change my lifestyle to be more healthy, and I really need to exercise more. :) Thanks for commenting, I really love your blog. My weight has been up and down like a yoyo for years - I was at my lightest when I was a university and in all the years since i've piled the weight back on, it really gets at me a lot. But just can't find the motivation and i'm easily bored. I was meant to be start a new challenge of getting out and walking 2 miles a day but as it happens the weather has totally turned and it was snowing the past couple of days. I know it's a case of mind over matter and just doing it which is what I struggle with the most, I was never intending to loose weight at university, I just walked upwards of three miles to and from university because I was tight with money and walking was fun, now because I don't *need* to walk, I can't force myself. Ah well, hopefully i'll get there eventually! Looking forward to reading more of your lifestyle/healthy posts that's for sure, hopefully it'll inspire me to make the changes that I need to! Finding motivation is so difficult, and I get so easily demotivated and end up turning to 'naughty' foods cos I just can't be bothered to try. And the weather is a massive issue for exercise If you want to do outdoor things. You could always try and do some indoor stuff at home, I've used to 30 Day Shred before which is great as it's only 20 minutes a day. Or there are lots of workout videos on youtube you could have a look at. Inspirational :) you look bloody gorgeous in ALL the photos! But good for you and well done on the weight loss! I just read on Twitter that you're starting C25k, my only advice would be to not expect weight loss from it (at least not until you're running at least 5k three times a week). It will massively help your fitness and health though. Good luck with it and keep going (even when it's tricky). You have done incredibly, Emma! You should be so proud of yourself. With a healthy lifestyle comes a healthy body image so props to you for making your health your priority. Keep up the good work, the results are clear to see already! And remember that you are beautiful no matter what the scales say. Well done on your weight loss, I went through the same thing as you and have lost about a stone and a half at uni. It's so tough, especially when you plateau and just feel so disheartened when you're not losing anymore weight! I've just read through so many of your Healthy Living posts and they're so inspirational. It's tough but it will be so worth it! Be Happy. Be a Unicorn. Healthy Living #2 I'm Quitting Sugar!